PO BAG 1: Will Brazil's Cup spotlight burn too bright? Will Brazil's Cup spotlight burn too bright? Brazil's day has finally arrived. The sun rose Thursday on a tropical nation hosting its first World Cup in 64 years. Nearly half the world's population, well over 3 billion spectators, is expected to watch soccer's premier event and get a glimpse of the country that in two years will host the Summer Olympics. 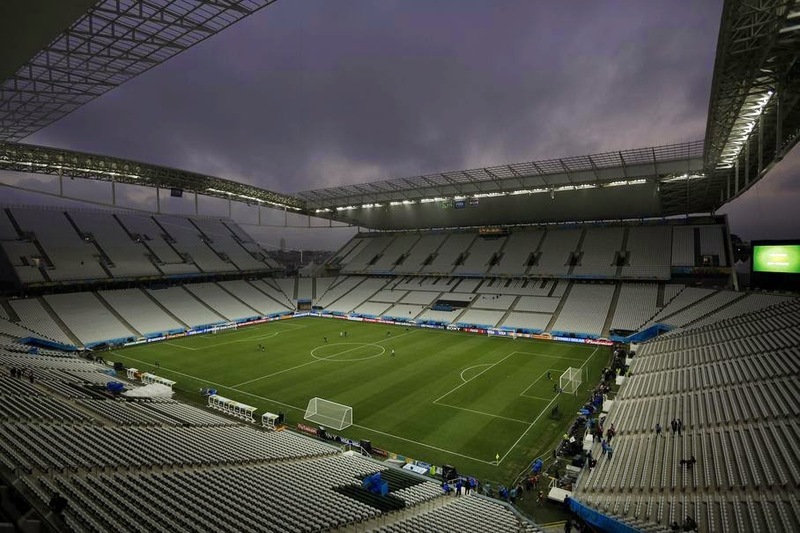 But just hours before play begins, it still isn't clear which Brazil we'll see. Will it be the irreverent nation known for its festive, freewheeling spirit? Or the country that for the past year has been a hotbed of fury over poor public services, discontent over a political system widely viewed as corrupt, and deep anger over the $11.5 billion spent on hosting the World Cup? By mid-morning, it looked like it would be both. Small protests broke out in Sao Paulo and Rio, but the streets were overwhelmingly filled with fans ready for festivities. "The world is going to see multitudes cheering for soccer — but also demanding that our country change," Helen Santos, a school teacher, said as she walked home in Rio de Janeiro. "The world needs to see that we're a serious country. We're not just a nation of soccer, but a country striving and demanding the government provide better education and health care. The world needs to see the reality of Brazil, not just the sport." Soccer will take the spotlight when play begins with Brazil and Croatia meeting in Sao Paulo on Thursday. Brazilians are hungry to see their soccer juggernaut deliver a record sixth World Cup crown to a nation desiring something — anything — to celebrate after enduring a year of grueling protests and strikes. 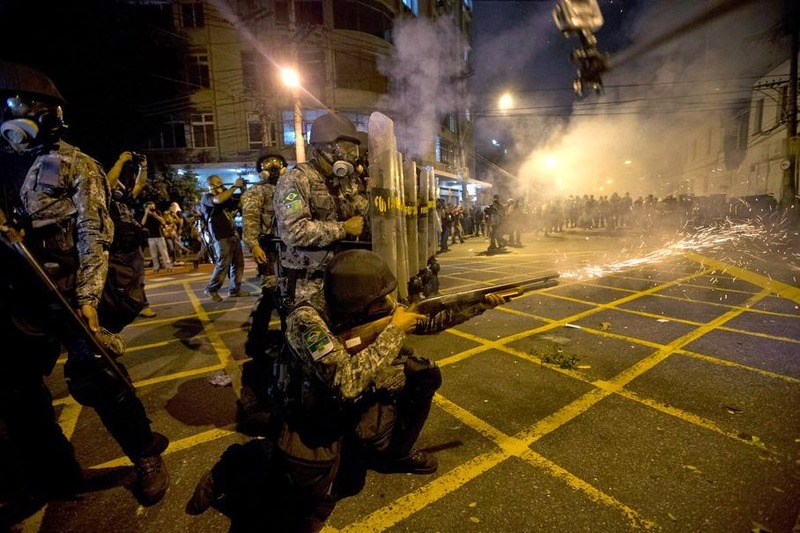 Police in Sao Paulo used tear gas to disperse a small group of anti-World Cup protesters who tried to march on a main roadway. Striking airport workers in Rio de Janeiro temporarily blocked the main highway leading from the airport into the city. More protests are called or in both Rio and Sao Paulo, along with at least five other cities. It wasn't clear how large the demonstrations might be. Street protests have lessened in size since last year when Brazilians staged raucous rallies against the government, overshadowing the Confederations Cup soccer tournament. On one night, about a million people spontaneously spilled into the streets of various cities. For two weeks, dozens of places were roiled by unrest. 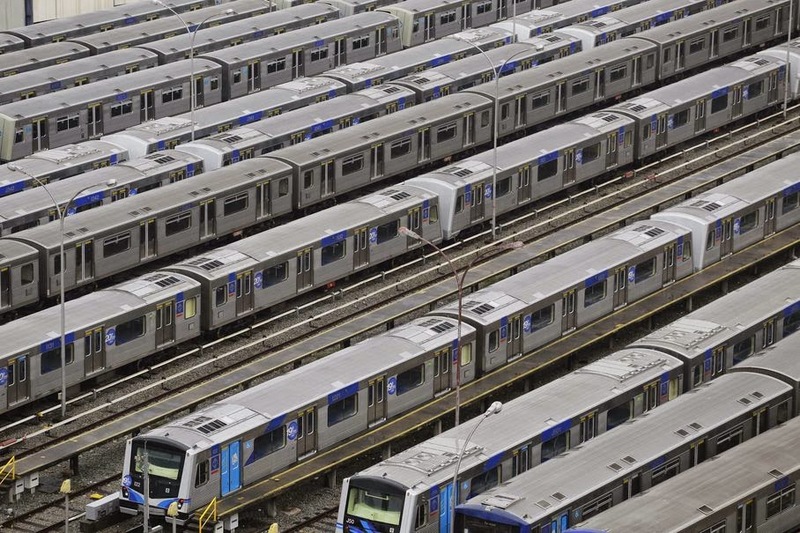 Whether Brazilians have moved past such mass disruption is uncertain. "I hope the soccer outshines the protests, but I also know there remains a climate of anger," said Edson Carvalho, an office assistant watching 10 barefoot young men play a pick-up soccer match in Rio's Botafogo neighborhood. "What will the world see? I'm waiting to find out myself." 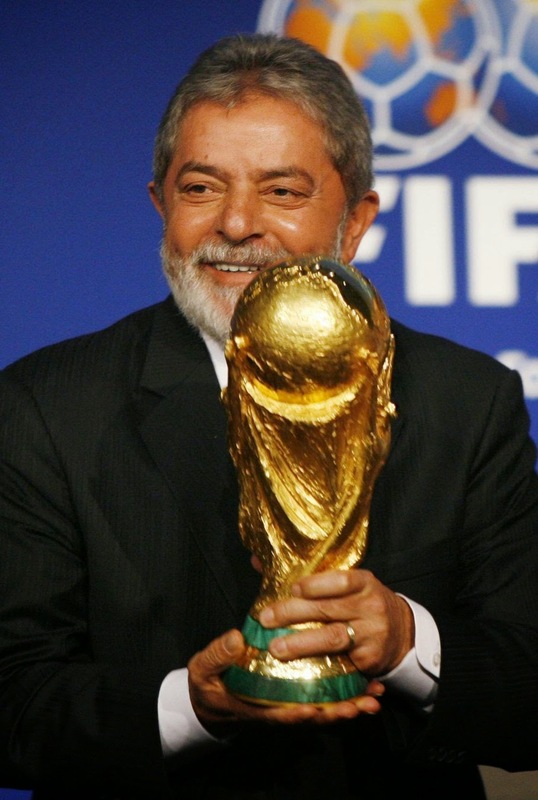 In 2007, when FIFA named Brazil as the host nation for the 2014 World Cup, the country's folksy and immensely popular president at the time, Luiz Inacio Lula da Silva, told a celebratory gathering in Zurich he would return home filled with joy — but also feeling the burden that comes with hosting the world's biggest sporting event. "At the heart of the matter, we're here assuming as a nation, as the Brazilian state, to prove to the world ... that we're one of those nations that has achieved stability," Silva said then. "Yes, we're a country that has many problems, but we're a nation with men determined to resolve those problems." Silva added that he "wanted to assure FIFA officials" that Brazil would prove able to put on a great Cup. Seven years on, as the global spotlight finally shines on Brazil, the world will see a great sporting event, with soccer returning to one of its most passionate cores, on a continent that relishes the game.